China’s polyester fiber accounts for more than 70% of the global market share and the capacity is still growing fast. Once we worried that the rapid and continuous expansion may result in excessive supply that was hard to be consumed, but actually, the potential demand from downstream fabric mills was still great. With the integration of the polyester industrial chain, closer attention to upstream and downstream linkages is increasingly important. 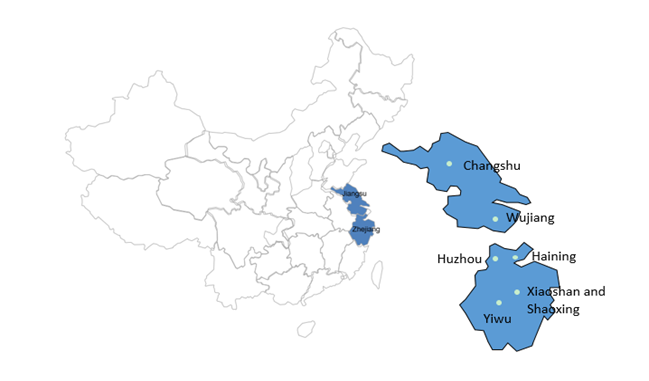 Operation Report of Fabric Mills in Zhejiang and Jiangsu mainly focuses on the downstream weaving and knitting bases in Zhejiang and Jiangsu. In China, more than 70% of the polyester filament yarn production is consumed by the weaving and knitting mills in Zhejiang and Jiangsu. The operation report aims to provide a clear understanding on downstream market of polyester filament yarn. Monitoring the trends, profit status, operating rate, new orders, inventory level and raw materials preparation can yield important insights and opportunities. ※ Taffeta and Flannel are two most conventional grey fabrics in Jiangsu and Zhejiang fabric market, so we monitor and analyze the price and profit of the two grey fabrics to reflect the market situation and trend. Theoretically, when polyester filament yarn increases 1,000yuan/mt, the cost of taffeta and flannel increase 0.1yuan/meter and 1yuan/kg, respectively. The new order index reflects the grey fabric sales and is divided into 5 grades. Inventory refers to grey fabric inventory in main weaving and knitting bases. 15 days is a normal level according to the historical experience. Feedstock preparation of fabric mills refers to the stock of polyester filament yarn. 10-15 days is a normal level according to the historical experience. Dyeing fee surge, how will printing and dyeing industry fare?